Despite the success shown in prototypes from groups like Boston Dynamics, bipedal walking is still really hard to implement. 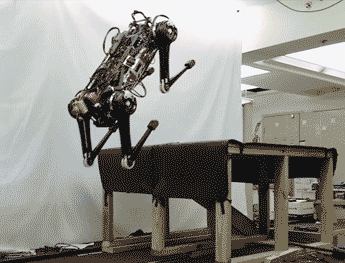 When the robot lifts one leg, it has to shift its center of gravity over the other leg to avoid falling sideways. The Autonomous Legged Personal Helper Robot with Enhanced Dynamics (ALPHRED) is getting around this problem by coming at it from a different angle. ALPHRED walks sideways and throws away the distinction between arms and legs. The bot is RoMeLa at UCLA’s latest evolution in their approach to traditional bipedal roadblocks. Sideways walking is something we covered when we talked about their previous version, NABi, which had only two legs. ALPHRED expands that to four limbs. As the video below shows, all four limbs can be used for walking using either a wide, stable sprawl or the limbs can reorient to a narrower dog or horse-like stance for faster running. Beyond walking, one or two of the limbs can be put to use as hands to open a door or hand over a package, which is why they refer to them as limbs instead of legs or hands. Only an animation is shown of that configuration but RoMeLa is a robotics lab which we keep an eye on so we’ll let you know if they demonstrate it. The video goes on to show a neat actuator with active compliance which they call BEAR, Back-drivable Electromagnetic Actuator for Robots. A search turned up no further details but let us know in the comments if you have any. We also liked seeing how they use a speaker to give a rough idea of the amount of current being drawn. While it’s both practical and a hack, it also adds a nice sci-fi touch. The wheel is a revolutionary invention — as they say — but going back to basics sometimes opens new pathways. Robots that traverse terrain on legs are on the rise, most notably the Boston Dynamics Big Dog series of robots — and [Ghost Robotics]’ Minitaur quadruped aims to keep pace. One of [Ghost Robotics] founders, [Gavin Knneally] states that co-ordination is one of the main problems to overcome when developing quadruped robots; being designed to clamber across especially harsh terrain, Minitaur’s staccato steps carry it up steep hills, stairs, across ice, and more. Its legs also allow it to adjust its height — the video shows it trot up to a car, hunker down, then begin to waddle underneath with ease. This is the first official look at Boston Dynamics’ new robot design, called Handle, and it’s a doozy. They are a trusted source of cutting-edge real-world robotics, which is good. If this came from an unknown source we’d be scrambling to debunk it as fake. This robot shows incredible utility, the likes of which has been relegated to the computer graphics of the movie and video game industries. At the beginning of the month, we saw a demonstration of the robot but it was simply cellphone footage of a conference hall video. This is a crystal clear 60fps video from Boston Dynamics themselves with a few juicy details to go along with it. Chief among them (for us anyway) is that this prototype has a battery range of about 15 miles between charges. The efficiency is due in large part to the wheeled nature of the beast. It balances on two wheels, but the design attaches those wheels to two fully articulated legs rather than directly to the frame of the body. Bravo BD. We can’t wait to see Handle wheeling down the street placing smile-adorned boxes on each stoop as it revolutionizes home delivery. Oh, and kudos on the 80’s-style freeze frame at the end of the video below.